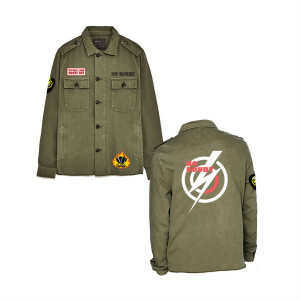 Limited edition green military jacket. This custom jacket has a large screen print lightning logo on the back, No Doubt embroidery on front pocket and 3 embroidered patches on front and sleeve. I love this jacket! I get lots of compliments on it and it's perfect for any fan. I love this jacket SO much! It’s beautifully detailed and it’s heavy so it’ll keep you warm. I’m so glad i bought it! Amazing style, fit and quality. I bought a second for my daughter! !